With the economy the way its been, we've looked for ways of cutting back. I have had increased health problems that make it extremely difficult for me to work outside the home, what with asthma and parkinsons disease, not to mention having a young child at home. So we don't have cable tv (don't watch it anyway), or fancy cell phones, or other luxuries. We are very frugal in our grocery and household shopping. We mend clothes and go to Goodwill. I knit and sew. Back in early October I came across a recipe for making one's own laundry soap. I was intrigued, both for the possible money savings and for something that doesn't make me itch. Being who I am, I was also quite skeptical. Anything cheap doesn't work, right? Wrong. We made a five-gallon batch and we still have over half the batch left. The five-gallon batch cost less than one small container of store-brand liquid detergent, doesn't make me itch and gets our clothes clean. I also discovered that other cleaners can be made from some of the same or similar ingredients. This is all stuff you can get at the grocery store. In addition to these, we buy bleach, ammonia, white vinegar, and lemon juice. I haven't had to buy a prepared household cleaner since. These are recipes I myself use though there are hundreds of them on the 'net. 5 gallon bucket with locking lid. Brand: Sterlite. SAFETY NOTE: DO NOT ever mix bleach with anything but water. A very nasty chemical reaction can occur that creates deadly fumes. Don't even use old bottles for mixing cleaners. Grate the soap and put it in a sauce pan. Add 6 cups water and heat it until the soap melts. Add the washing soda and the borax and stir until it is dissolved. Remove from heat. Pour 4 cups hot water into a bucket. Add your soap mixture and stir. Fill the bucket with hot water. Let the soap sit for about 24 hours and it will gel. You use about 1/2 cup per load. You can add the fragrance to the soap itself or as you are adding soap to the wash - I usually add a drop or two of lavendar oil to the soap going in the wash. Mix together and keep in a tightly sealed jar. Use about 2 Tbsp in dishwasher with a few drops of liquid dish detergent. 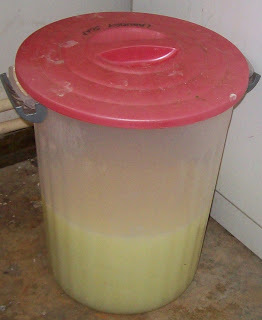 I add a bit of lemon juice or white vinegar to it just before running the dishwasher, and to the rinse agent container. Mix together and keep in tightly sealed container. Use as you would Carpet Fresh or any freshener. Note: Borax is poisonous. Please be careful using it and rinse dishes well. We've not had any trouble with it. Also - NEVER mix bleach with anything (putting it in the laundry is ok with laundry soap) esp vinegar or ammonia - the fumes are extremely toxic.